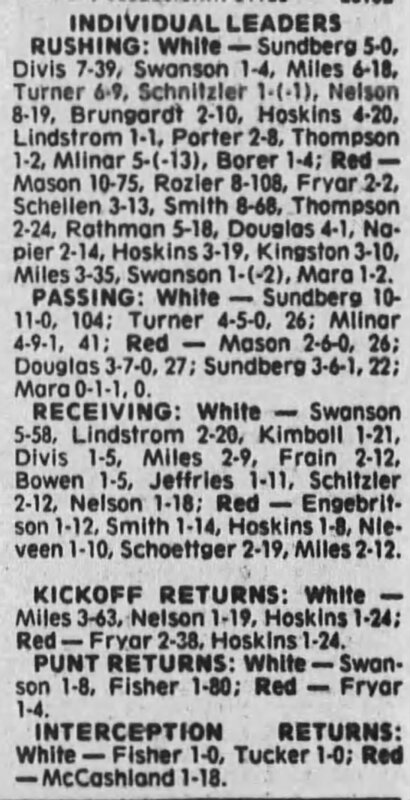 All-American I-back Mike Rozier scored two touchdowns and gained 108 yards on eight carries to lead the Reds to a 37-14 victory over the Whites in Nebraska’s spring football game. Rozier scored on runs of 57 yards and 1 yard, both in the third quarter, to help the first- and fourth-team players overcome a second-quarter deficit. A pair of records fell as the Reds rushed for 387 yards in 52 carries and the Whites completed a record 18 passes. Quarterback Craig Sundberg hit 10 of 11 for 104 yards for the Whites in the first half and switched to the Reds to hit 3 of 6 for 22 yards in the second half. I-back Paul Miles also scored for the White team in the first quarter and switched to the Reds to score in the fourth period. Coach Tom Osborne said that overall it was a good spring and he was pleased there were no serious injuries. “We might be a little concerned about our defense because mostly the offense stopped itself, except that the defense was limited in not being allowed to blitz,” Osborne said.